When I say “Jesus” I’m not talking about some blond-haired, blue-eyed, pale-skinned-relative-complexioned cracker Christ, I’m talking about the Jesus of the Bible with hair like lamb’s wool. I’m talking about that good hair. I’m talking about that nappy hair … Jesus, the black revolutionary Messiah. Almost 15 years after Voodoo, there’s a new D’Angelo album. And it’s called Black Messiah. Before listening to it, I saw Exodus: Gods and Kings. I’d tasked myself with seeing Exodus before I’d learned about the backlash to the movie. It was the final chapter in a year filled with highly profitable popular culture that centered on religion (four of the top 45 grossing films of 2014; Lecrae’s album going no. 1 on the Billboard 200). But the backlash stripped much of the “God movie”–ness from the film. As many noted, including David Dennis Jr. in two pieces on Medium, the primarily white cast of the film based in Egypt and the Middle East is problematic. Especially when you consider the roles of many of the non-white actors. When you look at it like this, it’s almost comical. Almost. It’s that “this racism is killing me inside” notion that Dave Chappelle once identified in his “Niggar Family” sketch on Chappelle’s Show. You’re laughing because it’s so blatantly disrespectful that you’re besides yourself. And you’ve almost given up because people are just so blatantly terrible. Or, through another lens, they forget you exist. I can’t mount a film of this budget, where I have to rely on tax rebates in Spain, and say that my lead actor is Mohammad so-and-so from such-and-such. I’m just not going to get it financed. So the question doesn’t even come up. It’s one of those statements that reminds you to shout at the top of your lungs, “black lives matter.” They matter in the sense of being protected, but also being represented. After sitting through all 150 minutes of Exodus, a film about white Moses and white Egyptians — a film that genuinely didn’t need to be made — it’s almost comical that the director felt as if stocking up on “non-Mohammad so-and-sos” was the answer. Scott may not have been wrong that white star power is what got his movie made. 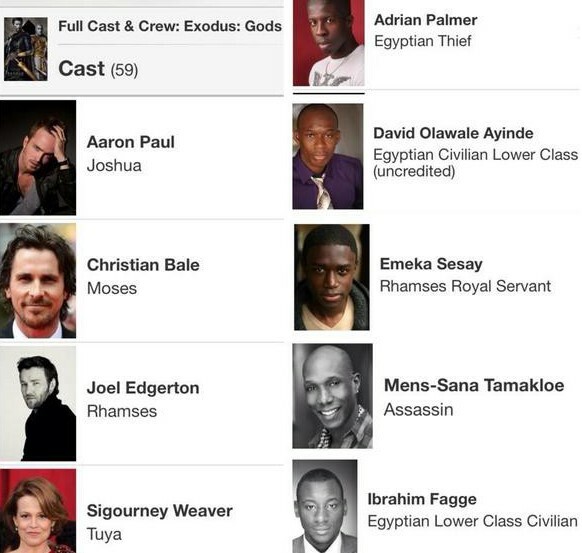 But that doesn’t mean Exodus: Gods and Kings is actually worth seeing. It’s an especially tough watch after seeing a film filled with Mohammad so-and-sos from such-and-such: Ava DuVernay’s Selma. It’s about people rising up in Ferguson and in Egypt and in Occupy Wall Street and in every place where a community has had enough and decides to make change happen. It’s not about praising one charismatic leader but celebrating thousands of them. Not every song on this album is politically charged (though many are), but calling this album Black Messiah creates a landscape where these songs can live to the fullest. Black Messiah is not one man. It’s a feeling that, collectively, we are all that leader. The stories of Selma and Exodus are surprisingly similar. A man becomes a leader and is trusted to lead through his relationship with — and faith in — God. It’s not always clear what the plan is, but each man’s followers see him as their best shot at a better life, out from under the oppressive, tyrannical law of the land. Both protagonists, Martin Luther King Jr. and Moses, are in unique positions of power. They can not only make demands to the establishment’s leader, but also give warnings as to what will happen should those demands not be met. Both King’s and Moses’s people are considered lesser than. And in both cases, the messiah-like figure is humanized. And both films are topical, but for wildly different reasons. Exodus is topical because it seems to round out an unusually disrespectful calendar year. A year when accuracy, equality, and fairness seemed to be outweighed by being first, being the most profitable, and attracting attention by any means necessary. Selma, on the other hand, is topical because it mirrors a fight against what the casting of Exodus represents. It’s a film about marches 49 years ago, coincidentally happening at a time when marches are taking place across the country. It’s a film about 1965’s peaceful protests and the police state, as 2014’s peaceful protests are showing how eerily similar the racialized police state still is, almost half a century later. 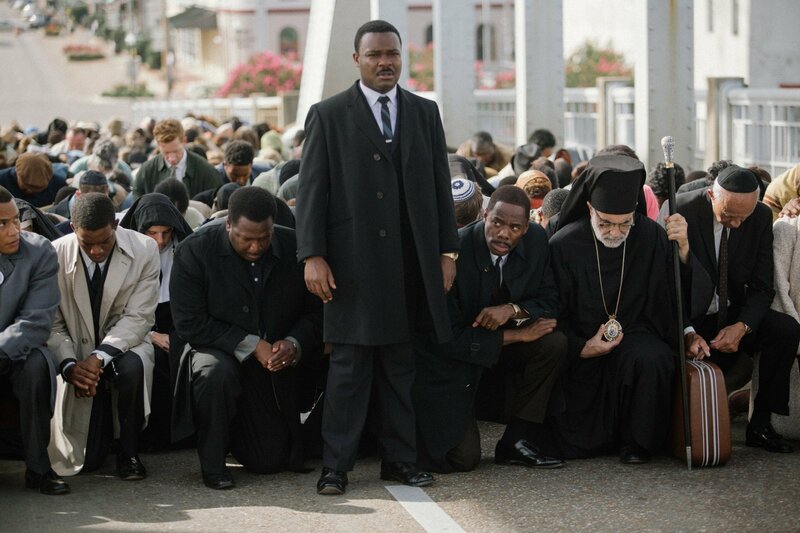 Selma is a film we need right now, and not just because King was played by David Oyelowo, not Jeremy Piven (a fair Exodus analogy, unfortunately). Practically and inspirationally, it is important in this moment. It’s a film focused on some of our nation’s greatest tacticians, held up by a commitment to never giving up. When Selma began filming, the country was not in the place it is now. But we’re now here. And it feels as if the union of this film and the reality of the moment were always meant to be. Which brings us back to D’Angelo. The Black Messiah sneak-attack release is being framed as if it came out of nowhere, but this album has been around in various forms for years. Now that it’s suddenly here, with all the waiting and wishing and frustration, it’s hard to imagine it coming out at any other point. With this new D’Angelo material that ultimately became Black Messiah, the great question was what D’Angelo had become more than a decade after his last album. Essentially, would we get D’Angelo as Erykah Badu or Lauryn Hill? Even while watching him two years ago — clearly still a force in his jam-session-like shows — it wasn’t certain how it all would translate into another project. Or, more notably, if it would. D’Angelo seemed to shun this idea of giving the people exactly what they wanted — in other words, taking off his shirt and just playing his old hits — and instead traded that in for lengthy versions of new songs that no one knew. This screamed Lauryn. Also screaming Lauryn: a significant buildup for something that might never happen. But then, last night, an actual album came out. An album in which D’Angelo gives the people what they want, because it’s what the people need, without trying to replicate previous successes. It’s almost as if his voice had gotten better with time. That’s the story of post-Baduizm Erykah: evolving, making your audience evolve, and leaving bread crumbs so every subsequent release can be traced back to the origin. Black Messiah is not Voodoo, nor is it Brown Sugar. Yes, there are glimpses of both in this album, because it’s still D’Angelo, but for every one of those moments there’s a Sign ‘O’ the Times Prince moment and a Musicology Prince moment. A There’s a Riot Goin’ On Sly moment and then a Fresh Sly moment. A Curtis and a Maxwell. A Jimi and an Isaac. A Miles and a double serving of Parliament-Funkadelic. And, on top of that, there are uniquely D’Angelo moments, ones that are reminiscent of the past and ones that we’ve never heard from him before. Black Messiah is a hell of a name for an album. It can be easily misunderstood. Many will think it’s about religion. Some will jump to the conclusion that I’m calling myself a Black Messiah. For me, the title is about all of us. It’s about the world. It’s about an idea we can all aspire to. We should all aspire to be a Black Messiah. It’s a good sign that D’Angelo does not see himself as the black Messiah. But to quote Jay Z, this is black superhero music. And in a multitude of ways. From having the album channel the pantheon of black artists before him to the black fists in the cover artwork to the album title to the political nature of some of the songs, to simply new D’Angelo, it’s what people need right now. 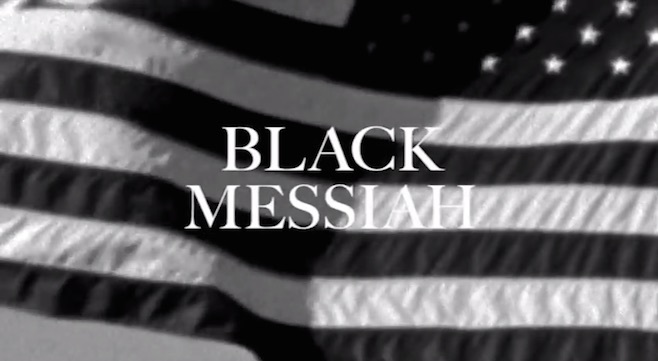 Even if D’Angelo’s not a hero, the act of releasing Black Messiah when he did feels heroic. Because it’s giving his culture a sorely needed boost. It’s rare that the public needs a record more than the artist does. One may think D’Angelo’s legacy was in dire need of a jolt, but no more so than the rest of us. It’s almost as if D’Angelo looked around at society and felt like it was time. Selma truly was a coincidence in its topicality. Black Messiah, perhaps not so much. It felt as if Black Messiah took forever, until you listen to Black Messiah. And then, immediately, it screams, “When you’re ready, and when they’re ready.” It’s an album that was always supposed to come out when the time was right. When the public would appreciate it. When we were craving something — anything — with substance and style, and not just our bottled memories of D’Angelo or some attempt at Voodoo II. We had to catch up to D’Angelo and D’Angelo had to grow to trust us. For both of our sakes, I’m glad we finally met in the middle.